The St. Clair Drake Center’s new Black Male Leadership Academy is encouraging dozens of Chicago Black male teens to have confidence and think big. 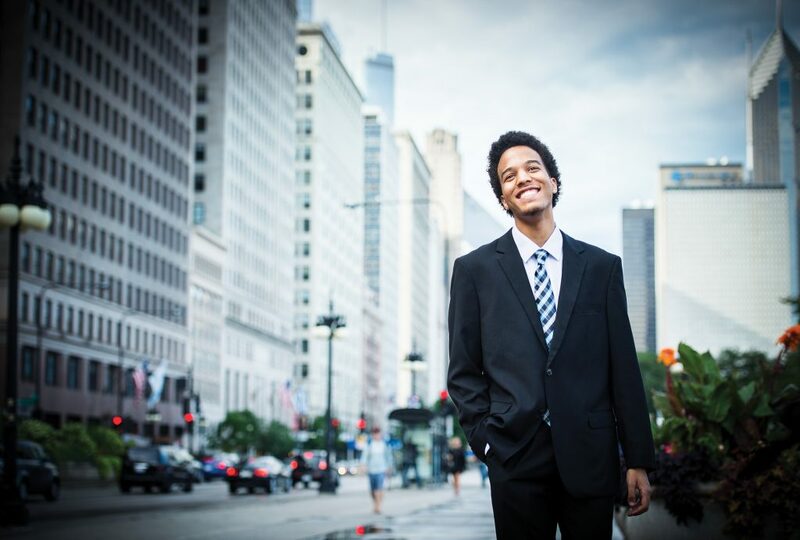 It’s an experience ­— and message — that 16-year-old Isiah Sheppard has taken to heart, following a dream to produce an award-winning documentary about Roosevelt University’s founding that is paving the way for a promising future. Isiah Sheppard’s award-winning documentary about Roosevelt University’s founding is as much about leadership as it is about history, which isn’t surprising given his participation in the University’s Black Male Leadership Academy (BMLA). In the nine-minute video that was a finalist in this year’s Chicago and Illinois state history fairs, Sheppard sounds older and wiser than his 16 years as he ponders the meaning of leadership, a trait that his BMLA mentors – all successful black men at Roosevelt – have modeled and encouraged. “What does it mean to be a leader?” Sheppard asks as the camera pans Chicago’s skyline for the piece that includes interviews with retired Roosevelt President Chuck Middleton and University Historian Lynn Weiner. “To have courage?” he continues, hitting on a theme of the documentary that traces the actions of a leader, Roosevelt’s pioneering first president Edward J. Sparling. “To put your livelihood on the line for the greater good of others?” he asks, spotlighting Sparling’s principled decision to found Roosevelt in 1945 as a place where blacks, Jews and other minority groups would be welcomed, even as other colleges, using admission quotas, turned them away. 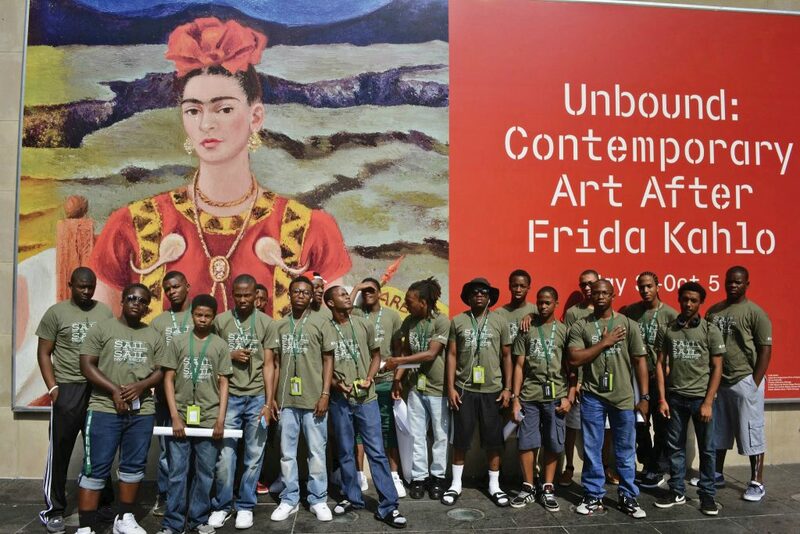 Started in the summer of 2014 by Roosevelt’s St. Clair Drake Center for African and African American Studies, the BMLA reaches out to promising young black teens who are entering their sophomore year of high school, helping them build up four capitals: intellectual capability, cultural experience, social grace and leadership skills. So far, 34 black male teens, including Sheppard, have participated in the program that is now in its second year of operation. The program offers a one-week summer session that was held July 21-24 as well as programming on the second Saturday of every month at the University. 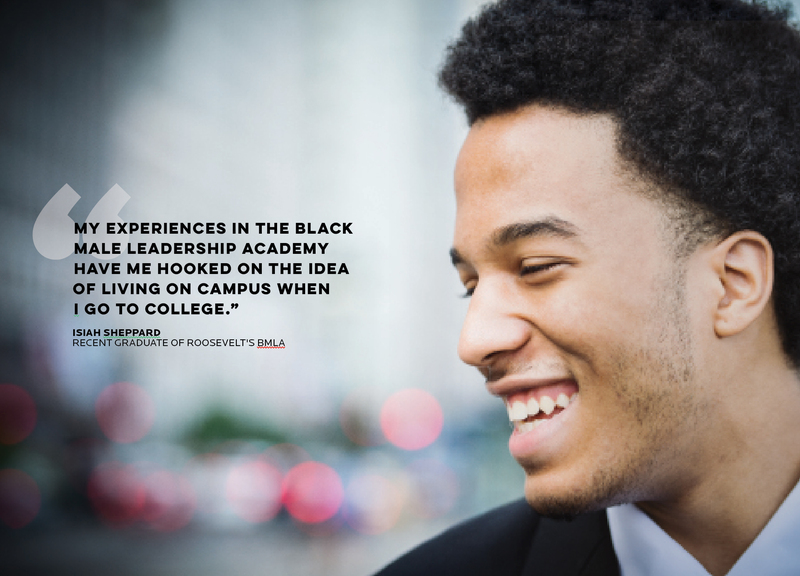 From that brainstorm sprang the BMLA, a college-preparatory, life-skills and cultural-awareness program pairing talented but at-risk black males from Chicago high schools with African American male students, faculty and staff at Roosevelt. Bennett’s research into specifics bears out the sad reality. 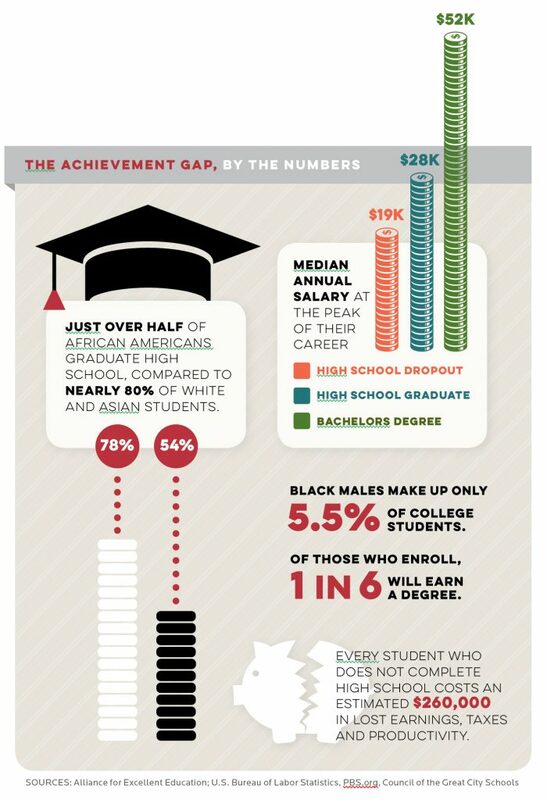 African American males are behind other groups in reading scores, in graduating from high school and in attending and graduating from college. Meanwhile, they are at enormous risk for spending time in prison, living below the poverty line and being unemployed. Bennett broached his idea for the BMLA about two years ago with Roosevelt University Honorary Trustee Robert Johnson, a 1958 alumnus who had studied with and was mentored while at Roosevelt by Drake. Additional financial support for the pilot came from Chicagoan Margery Feitler and Elissa Efroymson, vice chair of the Efroymson Family Fund. “The world we live in is competitive and I believe that kids from a young age need to know what they must do in order to compete,” said Feitler. Game Changers: In its very first year, Roosevelt’s BMLA wins a Game Changer award from the city of Chicago in 2014. 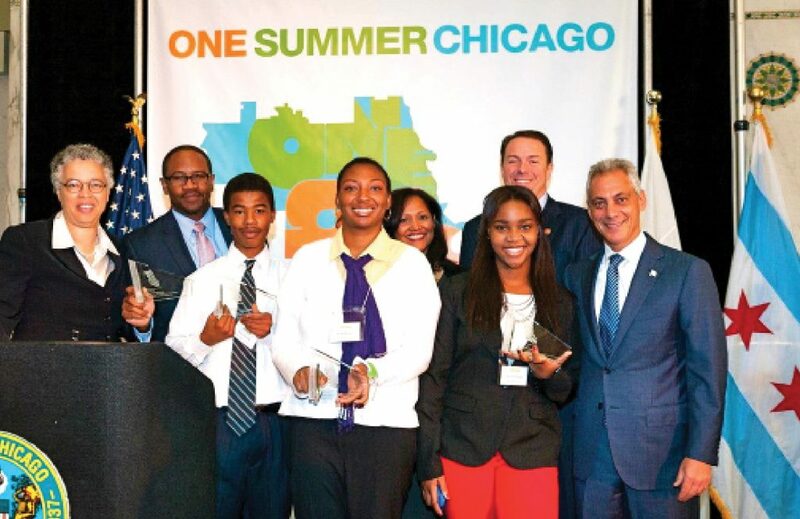 Winner of the prestigious Game Changer award from the city of Chicago’s One Summer Chicago in 2014, the BMLA currently is being evaluated by Roosevelt’s Policy Research Collaborative for data/evidence that could take the program to the next level. During the program, Sheppard met African American men from Roosevelt whose experience as mentors meant so much that they wrote personal essays for the University’s Social Justice Blog. “These youth are not stereotypical black males of their generation. They are my little brothers. I plan to see them grow and mature into successful black men,” wrote another mentor, Roosevelt journalism major Joshua Hicks. One mentor in particular, Michael Ford, chief of staff to Roosevelt’s president, has been a positive role model for BMLA participants. “He (Ford) taught me how to compose an email with a nice opening, good grammar and a professional closing,” said Sheppard, who then contacted Roosevelt’s historian for interviews for his school and history fair project. Ford recalls brainstorming with Sheppard on options for approaching the topic that was listed as a project possibility on the Chicago Metro History Fair website. He encouraged Sheppard to take it from there. When Sheppard’s high school history teacher, Linda Becker, first saw Sheppard’s documentary on Roosevelt’s founding, she recalls being “absolutely blown away” by its content, including images and mention of some of Roosevelt’s famous African American male students like the late Chicago Mayor Harold Washington, jazz pianist Ramsey Lewis and composer and instrumentalist Anthony Braxton. BMLA participant Isiah Sheppard wants to go to college, and is considering Roosevelt University as one of his choices. “Isiah used to be quiet. With this project, he seems to have become more comfortable with himself. Besides academic skills, he’s improved his networking skills and become more outgoing and social,” she said. One of those whom Sheppard has networked with extensively is fellow Westinghouse High School student Kendall Relf, a fellow BMLA participant who helped Sheppard edit his documentary on Roosevelt’s founding. “Before the BMLA, Isiah and I knew each other a little, but now we’re great friends,” said Relf. A musician who plays guitar, piano, bass and drums, Sheppard credits another of his black male mentors in the BMLA, Roosevelt musical theatre major Jalen Eason, with helping him brainstorm ideas for the new comedy series. “The biggest thing I try to get across is getting these guys to understand how important it is to get an education,” said Eason, who, like Sheppard, had family support, but few other African American male mentors while growing up in Ann Arbor, Mich. “Without an education, most black men in America are likely to face a lot of trials and tribulations,” Eason said. Sheppard’s mother, Aida Roldan, said she hopes her son will consider Roosevelt University as a college option. + later, as in the past coupla years? We went to Ravinia, cocktail parties, plays, group casual dinners, team trivia competitions & etc.